The Phillips Roe House, built in 1765, sits on a previously developed vacant lot within downtown Port Jefferson Village, along a self guided historic walking tour, and will serve as the home of a new Revolutionary War Interpretive Center. While the original intent of the project was to return the home to its historic form creating a visitors center for the village, investigation of the timber structure found it to be excessively damaged which led to the proposal to enclose it within another building rather than restore it and leave it exposed to the elements. 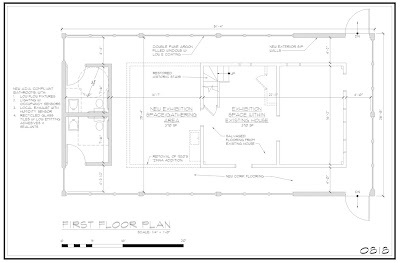 The proposed building is essentially one large 1,230 SF room with new bathrooms for visitors. 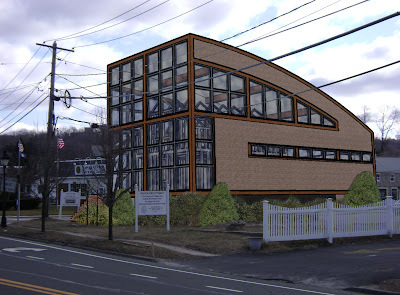 A long single sloped, South facing roof, which may provide a home for a future solar array, opens views to the North providing a dramatic panorama out to the harbor. 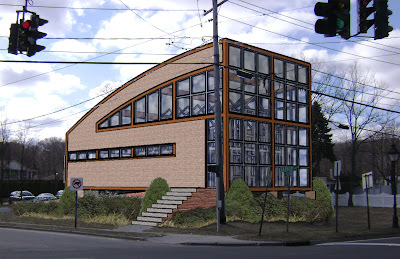 The large volume permits ample daylight into the space while facilitating natural ventilation using the stack effect. 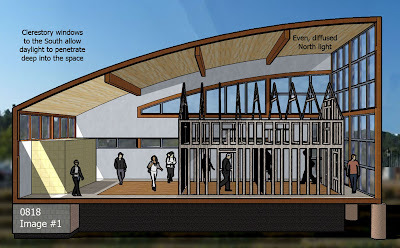 Pedestrians can also view the timber frame of the original two story home, which is exposed and structurally secured, that will serve as the centerpiece of the new Interpretive Center. The placement of the house within will allow people to move around and through it, while providing a larger gathering space towards the South for tours and school groups to gather. 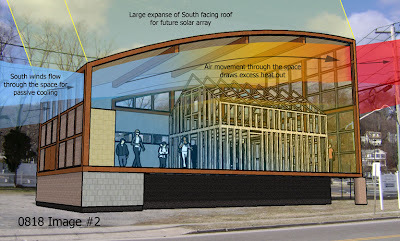 The building uses a combination of passive solar measures and energy efficient systems which help to minimize its impact on the environment, while meeting the needs of the center. Natural day-lighting is brought into the space mainly from the North, which allows consistent even light that doesn’t degrade artifacts on display as part of the Revolutionary War Interpretive Center. 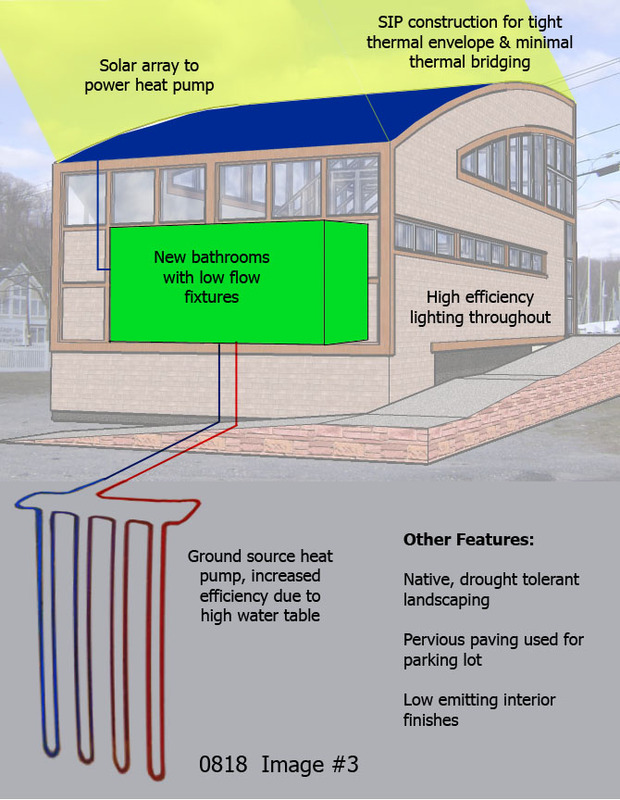 The ground source heat pump, with pumps run by a solar array on the South facing roof, has improved efficiency due to the area’s high water table and can be used in combination with natural ventilation when exterior conditions allow. A combination of environmentally preferable materials, low flow plumbing fixtures, and native drought tolerant plants supply a healthy environment, while giving life to an old building that provides an educational historic space for visitors to the Village of Port Jefferson.